Use the following resources as you work with teachers to enhance and grow the classroom community and physical environment. Classroom culture refers to the social-emotional tone or climate in a room. Children need safe and caring communities to take the risks necessary to learn. Reflective practitioners continuously think about how to create a classroom that meets the needs of all the children. Use these questions to guide your conversations with a teacher around classroom culture. How well do you know the children in your room? What are some things you do to build relationships with the children? What are some things you do to learn about children’s families? Why is this important? How does what you learn about children and their families affect your instruction? What are some ways you help children form healthy relationships with each other? Do all the children in your class feel valued and included in the community? What makes them feel this way? Think about a recent interaction you’ve had with a child. How did it go? How did the child feel? What did you say or do to create that outcome? Have you ever said something that you wished you said differently? Let’s talk through how the conversation could have been different. How do the children sound with each other? What do you do in your room to teach children the communication skills they need to work and play well with others? Do the children in your room transition smoothly during the school day? What procedures and routines do you think are working really well in your classroom? What are some procedures that could be tightened up? When in the school day are your children “off-task”? Are there procedures you can put in place to help this? How often do you need to give directions to children? Are there areas where children could learn to manage themselves and develop independence? How do you teach procedures? How do you know when children “get it”? What are some ways children take care of themselves, each other and the classroom? How do children know what is expected of them? What are some reasons children may not be successful in fulfilling their responsibilities? What happens when children don’t fulfill their responsibilities? Do the children in your class behave the same way outside of your classroom or with other teachers? Why do you think that is? Think of a time you were frustrated by something that happened in the room. What did you say or do? What do you think the children learned? What happens when children feel frustrated or have difficulty regulating their behavior? What is in place in the classroom to help children? Do children know what to do with their “big emotions”? What happens when problems arise in the classroom between children? Are there processes and procedures in place to work out differences? Use these conversation starters to talk about the Classroom Culture. Reflective practitioners think deeply about their instruction— both the content and children’s engagement. Use these questions to guide your conversations with a teacher before and after the teaching of a new procedure to enhance the lesson and help grow a teacher’s practice. What procedure do you want to teach? Why did you choose this procedure? How does it relate to materials, space, or processes within the classroom and/or school building? What will you say to help children understand this procedure within the context of their responsibilities to the classroom, each other, and themselves? How will you explain the importance of this procedure in such a way that children feel engaged and cooperative? How will you connect this procedure to the broader goal of children’s self-monitoring and self-regulation? What language already exists in the classroom environment to support children’s understanding and success with this procedure? Will children need to learn any new language (e.g., Tier II words such as “cooperation”, “collaboration”, “negotiate,” etc.) How will you define these words, using child-friendly language, or demonstrations and other strategies that meet the needs of ELLs? How will you demonstrate the procedure so that children know what it should look like and sound like? Will you act it out through modeling or a role play? How will children be able to practice or explore this procedure (one or more times) during the lesson? How will you engage children in conversation and reflection before, during, or after you teach this new procedure? Will you be creating or referring to an anchor chart? How will you elicit children’s language to incorporate in the anchor chart? What do you think the children learned during the lesson? How do you know? Did children demonstrate some success in the practice of this procedure, and in the use of any related language? How will mastery of this procedure help children to take responsibility for themselves, each other, and the classroom? How will it help them to solve problems without adult intervention? Were the children engaged and excited to learn this new procedure? What evidence was there that children understood the importance of this procedure to the overall classroom environment? Did the children have an opportunity to ask their own questions and express their ideas? How will you continue to practice and reinforce this procedure until children master it? How and when will you review related anchor charts to support this procedure? What did you learn about your children during this lesson? How did you connect the learning in this lesson to the broader goal of children’s self-regulation and self-monitoring? How was the pacing? How long did the entire lesson take? Use this resource to guide your observations and conversations around procedures and responsibilities. Use these conversation starters to talk about procedures and responsibilities. 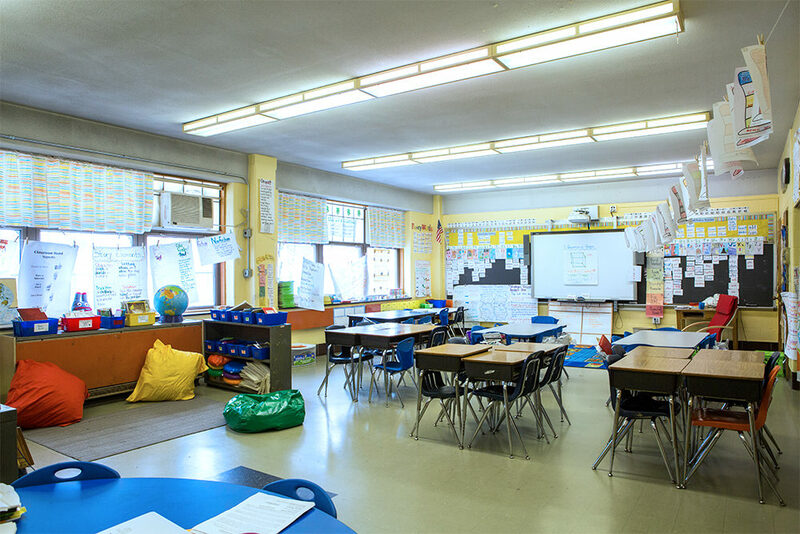 Taking the time to thoughtfully plan and organize the physical environment of the classroom has a huge impact on children’s learning. In addition to making children feel comfortable and welcome, a sense of safety and order in the room is a prerequisite for the risk taking that leads to significant academic growth for all children. The physical environment is analyzed in reference to four components: space, books, print, and time. Where is your large group meeting area? How often and for what purposes do you gather there with children? How does the arrangement of desks and tables in your room promote communication and collaboration? How is your library organized? How does the arrangement of the library invite children to sit and enjoy reading there? How does the library communicate the importance of reading? Where is your small group meeting area? How often and for what purposes do you and/or children use this area? How are materials for independent work organized and labeled for children to access them? 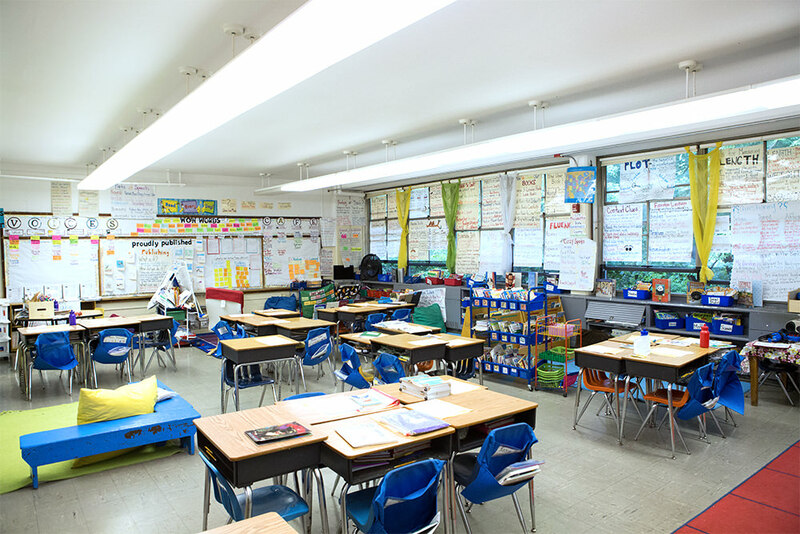 How are children involved in the organization, management, and upkeep of the classroom? Are there spaces for children to work both independently and collaboratively? 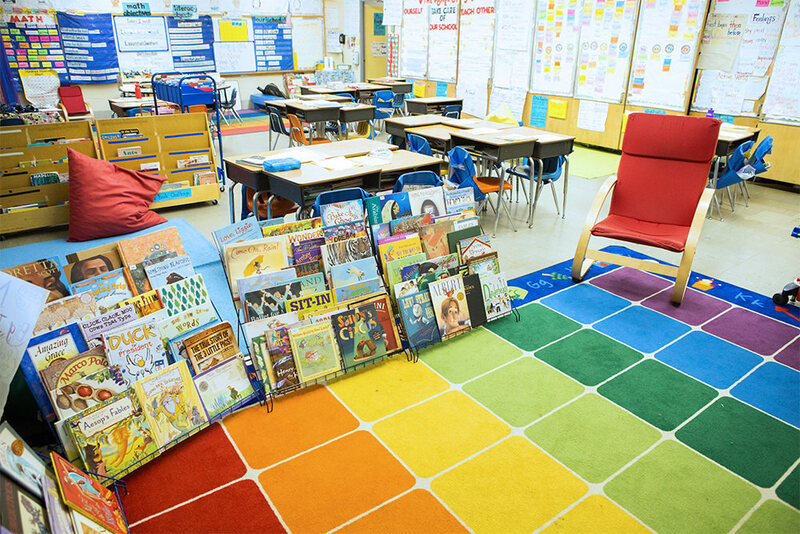 Are there teacher materials (not used by children) which could be removed in order to make the classroom space feel less cluttered and more child-centered? Do you feel your room is tidy and appealing? How are your books organized? Have you clustered them? Are there bins for authors, themes, and genres? What visual supports do you have to help children navigate through the collection? Are some of your books sorted by levels for children to choose from for independent reading? How do you learn about your children in order to ensure that the books reflect their lives and interests? How do your books reflect children’s home languages and home cultures? How do your books expose children to new ideas? How often do you make changes in your book displays in response to changing children’s needs and interests? Is there a home lending library? What is the system for children to take out books? In what other areas of the room have you chosen to display books? How are books used in those areas? How do you generate print in your room to ensure that it is authentic (the product of shared learning experiences) rather than commercial (mass produced and purchased)? Where is the high frequency word wall? How are words chosen and when are they added to the wall? How do you help children interact with the word wall? What print is there to reflect the home languages of ELLs? What word banks are posted to support vocabulary development in content areas? What visual supports do you have for ELLs? Which charts were created with children (or in front of them) to support their independent practice following recent instruction? Where are some examples of children’s work at all developmental levels displayed? Does the print in your room reflect your current instruction? How is your literacy block organized? How many minutes do you have for language arts? What components are included and how much time is there for each component? Where is the schedule posted and how have you explained the meaning and importance of each component with children? Do you have visual supports for language learners? How much time do children have to read and write independently each day? How have you supported children in understanding the expectations and procedures in the classroom? Use these conversation starters to talk about the classroom's physical environment. How did the teacher use language to recognize effort, celebrate progress, and encourage cooperation? Do lessons include exciting news about children’s growth to encourage motivation and engagement? When children make mistakes, are they acknowledged for “partially correct” behaviors and encouraged to make adjustments that will improve their behavior (e.g., “You were so excited to come to the carpet and learn that you forgot to push in your chair. How about you go back and push it in so nobody trips?”)? Are power struggles artfully avoided with attempts to gain cooperation? Do children have time to talk? What evidence is there that conversation skills are explicitly taught and frequently practiced? Is there an anchor chart for “turn and talk” or “think/pair/share”? Are there other charts that relate to accountable talk, with suggestions (possibly sentence stems) for how to talk collaboratively with turn taking, clarifying questions, and agree or disagree statements? Do children have opportunities to talk built into each lesson? Do children spontaneously clap for each other, congratulate or compliment each other, or make encouraging statements when their classmate is struggling? Is time set aside for book talk? Does peer conferring occur? Is there an anchor chart to support and guide this behavior? What language is used to give feedback in response to children’s work? Are specific strengths of work acknowledged, in a precise way that furthers children’s understanding of their own emergent behaviors? Is time set aside for sharing work during which compliments are given by teacher and children? Is there a chart to support and guide this behavior? Do compliments outnumber suggestions for improvement? When discussing a mistake, are precise suggestions for improvement given that leave the learner motivated to make changes and continue to grow? How does the teacher build community? Does the teacher use the language of “we,” “us,” and “our” to build community? How often are the pronouns “we,” “us,” and “our” used by teacher and children? Does the teacher relate to children as a fellow reader/writer/mathematician/scientist, etc.? Are behaviors such as “respect” and “cooperation” modeled and discussed in a way that suggests these behaviors are expected and reciprocal between all adults and children in the classroom and school? What is the tone of the teacher and children? Is it calm and peaceful most of the time in the room? Do children and teacher address each other in a friendly, polite and collaborative manner? When difficulties arise, does the teacher calmly guide or observe a resolution? Does the teacher de-escalate tensions between children with suggestions for how to cool off and later resolve the problem? 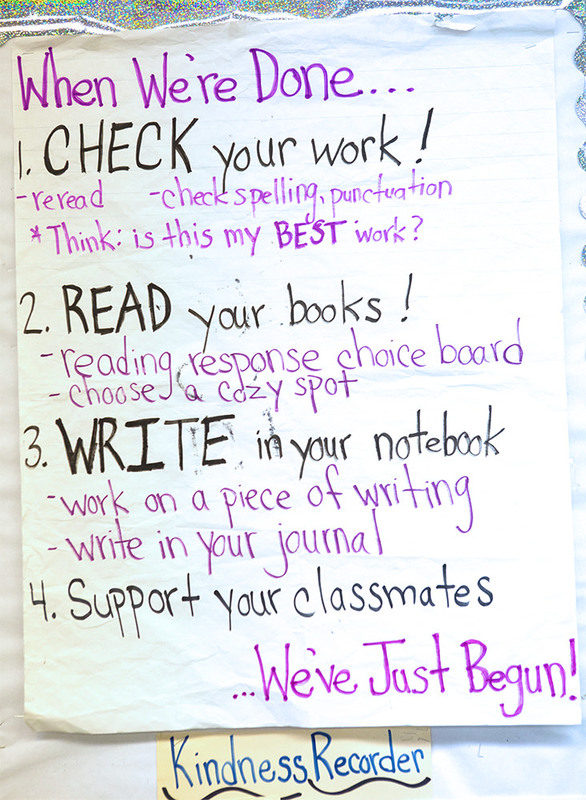 Are there anchor charts that suggest how to calm down or cool off (with deep breaths, writing in a journal, etc.)? When discussing problems, is the tone firm but not threatening? Are negative behaviors discussed privately and in a non-threatening way, rather than in a way meant to publically humiliate? Are possible consequences discussed in an honest and clear way that re-directs behavior, rather than in a manner which publically humiliates and possibly escalates behavior? How does the teacher gain children’s attention prior to giving directions or information? Wind chimes, rain stick, rattle, bells, or other device? Use this resource to guide your observations and conversations around language. Use this resource to guide your observations and conversations around gaining children's attention. Use this resource to guide your observations and conversations around calm language. Use this resource to guide your observations and conversations around building community. Use this resource to guide your observations and conversations around effective language. Use this resource to guide your observations and conversations around feedback. Use this resource to guide your observations and conversations around children's talk. How does the teacher build importance for this procedure by engaging children’s interest and cooperation? Does the teacher discuss (or allow children to discuss) what has or might happen without this procedure in place? Does the teacher pose this procedure as something to help the classroom community function more smoothly or safely? Does the teacher present this as an opportunity for cooperation, self-monitoring, and self-regulation—something to empower rather than control children? Are children invited to discuss and contribute to the development of this procedure? How does the teacher model or demonstrate this procedure? Is the procedure explicitly described and broken down into component parts? Does the teacher think aloud about the procedure? Does the teacher act out the procedure? Are children invited to demonstrate, model, or act out the procedure? Are children given clear indications of what this procedure looks like and sounds like? How and when do children reflect upon their performance of this procedure? Do children discuss and assess their performance of this routine through turn and talk, a self-rating using a certain number of fingers to indicate success on a scale, or writing/drawing after the lesson (or other appropriate occasions)? Do children have opportunities to celebrate when a procedure goes well? Do children “own” the procedure? How does the teacher reinforce the procedure and support the consistent implementation of the procedure? Is an anchor chart created? When will the anchor chart be reviewed? Are children encouraged to take charge of implementing this new procedure? Does the teacher provide opportunities for reflection and reinforcement over the day and days following the lesson? Does the teacher ensure that the new procedure becomes internalized and routine, such that it seems to occur naturally and without prompting? Do children take ownership of the procedure and remind each other of the routine as needed? Use this resource to guide your observations and conversations around procedural lessons. Use this resource to guide your observations and conversations around children's ownership. Use this resource to guide your observations and conversations around children's reflection. Use this resource to guide your observations and conversations around building importance. How does the arrangement of the space support children’s academic and social emotional needs and areas of growth? Is there a large group meeting area? How often and for what activities is it used? Is this area conducive to supporting discussions and mini-lessons? Is it accessible to ALL children? Does the desk arrangement promote communication and collaboration among children? Is there an organized, inviting library space with comfortable seating which feels like the heart of the classroom? Is there a space for small group instruction? Are the teacher’s and children’s materials organized and accessible? Is the room tidy, child-centered and appealing? Does it promote literacy exploration and language development? How are books organized and displayed in the room? Are clusters of books organized according to theme, genre, and/or authors? Are the book bins labeled? Are there visual and/or language supports to help children navigate through the collection? Are there book bins arranged by level and available for independent reading? Does the book collection reflect children’s lives and first languages, and expand upon their interests? Is there a home lending library? Are books displayed at different centers? What print is displayed in the room? Is the print authentic (made with, by, or in front of children) or commercial? Is there a high frequency word wall? Where is it located? Are there language and visual supports to anchor the vocabulary and print in the classroom? Are the anchor charts displayed a result of instruction — made with, by, or in front of children? Do the charts reflect current instruction? Are old charts retired or stored? Does any of the print reflect children’s home languages and home cultures? Do children use the print in the room to support their independent work? Are there examples of children’s writing at all developmental corresponding to the children in the room? How does the teacher manage the use of instructional time? Is there a daily schedule with visual supports posted for children? Does the daily schedule include key components of a balanced literacy program? How much time do children spend reading and writing independently each day? Are transitions smooth? Do children seem to know what to do and where to go between and during activities? Have children been provided with supports to understand and be successful with procedures and expectations? Use this resource to guide your observations and post-lesson conversations. Use this resource to guide your observations and post-lesson conversations around books. Use this resource to guide your observations and post-lesson conversations around time. Use this resource to guide your observations and post-lesson conversations around space. Use this resource to guide your observations and post-lesson conversations around print. Use this open-ended template to guide your observations and post-lesson conversations. This resource describes key elements of effective practice in an early literacy classroom. It is a valuable coaching tool because it standardizes expectations around different practices. Use the TELP to set goals with teachers and guide implementation. Dive deeper into each TELP descriptor with photos and detailed descriptions. Use this resource to set goals and guide implementation.